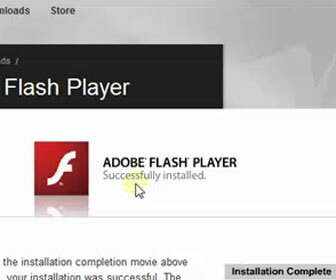 The Flash Player from Adobe is most popular multimedia web browser plug-in on the Internet. Without it you cannot view all video content on popular sites like YouTube and Facebook (though this is slowly changing with HTML 5). Even this site requires that you have the Adobe Flash Player installed to view all of its video content. [adblockingdetector id=”1″]Two good things about the Adobe Flash Player is that it is free and it works on all the popular desktop web browsers and major operating systems like Windows, Mac OS and Linux. Installing the Adobe Flash Player on Firefox only takes a few minutes and is painless, unless something goes wrong, lol. If something goes wrong I detail what the cause can be and how to troubleshoot the problem. PLEASE NOTE: The video tutorial below will actually work for Firefox 3.5 and above. The reason I named it Firefox 3.6 is because that is the version I used in the video tutorial. 4. If your Adobe Flash Player install has failed or is not working properly there are 3 main culprits. Firewall, Anti-Virus and Pop-up Blockers. The most popular ones are listed and how-to work around them.